The rest of the school day went by at a snail's pace. As Kaycee was walking home that afternoon, she swore she could hear Clyde's whinny, followed by Ace. But weren't they long gone now? She looked around, a confused look spread across her face. What was that noise? She shrugged her shoulders and walked on, when her thoughts of the Gypsy Farm were interrupted by the clopping of hooves. The steady sound of a canter on concrete. Kaycee hadn't heard it in so long, she was taken into its peaceful spell. The spell was broken, though, when a black blur whizzed past her. She blinked her eyes and looked around wildly. A black horse galloped off behind her. She whistled to it, and it skidded to a stop, its horseshoes screeching on the concrete. It turned to look at her, its big, bright, dark brown eyes blinking. Kaycee put her stuff down and ran to it. She grabbed its reins and studied it for a while. 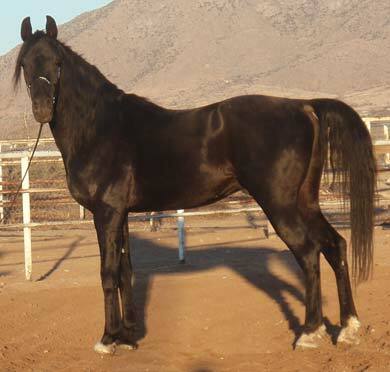 It was a large black gelding. She pondered on his breed. He had two back socks, and those were his only markings. "Well." Kaycee looked at him once more, and chuckled. "Who do you belong to, you little troublemaker? You sure are pretty..." The gelding was long and lean, had big bright eyes, and a shining black coat. He also had the dished profile as of an Arabian. "But you don't look full Arabian." Kaycee commented. "You look like some horse I read in a book once. 'Anglo-Arab... I've never handled a horse like you,'" she stated to him. "Now we have to find out who you belong to." She picked up her stuff, then led the horse by the reins to the direction he came. Kaycee led the horse downtown, and kept going when she saw a riding academy on the hill. "So this is probably where you came from, eh?" She patted the horse on the neck, then led him up the hill. There was four big riding arenas, and five big barns. It was a very nice looking place. "I didn't know there were ANY horses here," She said, astonished. She led the horse into the opening barn. A group of people were carrying on a conversation in the middle. "Where did he run off to?" She was able to pick up. She cleared her throat, and spoke up. "Uhm, I think I have your horse.. here." A young woman, about 26, looked up from the circle. "Oh! Thank you. Denali here is a WRECK." She took the horse's reins. "He's really pretty." Kaycee replied. "Uhm.. are you the riding instructor, or barn manager person?" She said shyly, hiding her hands behind her back. "Why, yes." The lady said. "Would you like to join this city's greatest riding academy?" She asked. Kaycee nodded. "Well.. yeah! And I'd really like to ride Denali if no one's already riding him." She said quickly. "Well, of course. Just meet me in my office real quick." This one was a bit shorter. Hope you still like it though. In the 'Denali' picture, the photographer and horse are unknown. Where is part three? I love it! I've looked everywhere for part 3 and can't find it! I hope you're still continuing because I really, really, really enjoy reading this story! Great! Really great! I love it how you make her seem to here horses hove pounding then there is a horse behind her! This is one of my faves to read. Make more!